A yoga and Pilates body mat makes it unnecessary for those who practice both exercises to buy two mats. 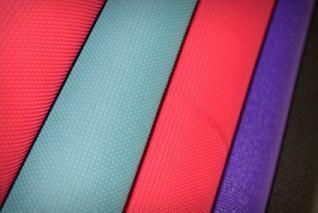 Those who practice yoga and Pilates benefit from the use of such a mat for its cushioning and anti-slip properties. This type of mat helps those who practice yoga and Pilates to use the body's weight to build strength. The purpose of the body mat is to support the different positions, movements, and demands of those who practice yoga and Pilates, offering both protection from slipping and cushioning to the body during postures that involve sitting, standing, and lying down. A yoga and Pilates body mat is typically rectangular in shape with approximate dimensions of 72 by 24 inches. Thickness varies from ¼ to ½ inches, and the mat is made of materials that are sticky and coarse to prevent slippage. These types of mats are usually made of a blend of cotton, polyvinyl chloride, or PVC, and thermal plastic elastomer. Some mats are made entirely of polyvinyl chloride or a closed cell foam material. Because vigorous forms of both yoga and Pilates are regularly done on body mats, they must stand up to friction and sweating, and also maintain their stability to resist shifting and bunching up. There are many choices of body mat types, including those that are environmentally friendly, sweat proof, heat retaining, and slip proof. Those who practice yoga and Pilates are also often concerned about protecting the planet, and manufacturers have responded by making environmentally-friendly options regarding yoga and Pilates body mats. These eco-friendly mats are typically made of natural rubber, which provides excellent grip, cushion, and resilience without the PVCs that may release harmful toxins and gases that can be breathed in during use and leaked into the soil when the mats are discarded. Phthalates soften the surface of PVC mats, but according to a study by the Greenpeace organization, they have been linked to altered testosterone levels and sperm counts as well as an increased likelihood of testicular and breast cancer. Mats that are constructed of closed cell foam are resistant to moisture. These anti-stretch mats remain tacky even when wet to provide a secure grip. They are easily maintained by occasionally wiping them down with a damp cloth to keep them clean and free of bacteria. Closed cell foam mats are also effective in retaining heat to help keep the muscles loose and enable the practice to stretch fully and maintain flexibility. Heat retaining mats also reduce the risk of injury and allow practitioners to deepen stretches and maximize their exercise. Some mat manufacturers focus on their slip-proof qualities, since the sweat produced by both yoga and Pilates can make it difficult to move and hold postures on slippery surfaces. These mats offer a superior sticky surface and have dual textured surfaces to provide better traction. Some offer a parallelogram texture for added comfort and support, and a wavy texture for superb traction and stability. There is no need to buy separate mats for yoga and Pilates when one mat can do the work of two. Save money and extend the durability of your mat by investing in one of high quality.